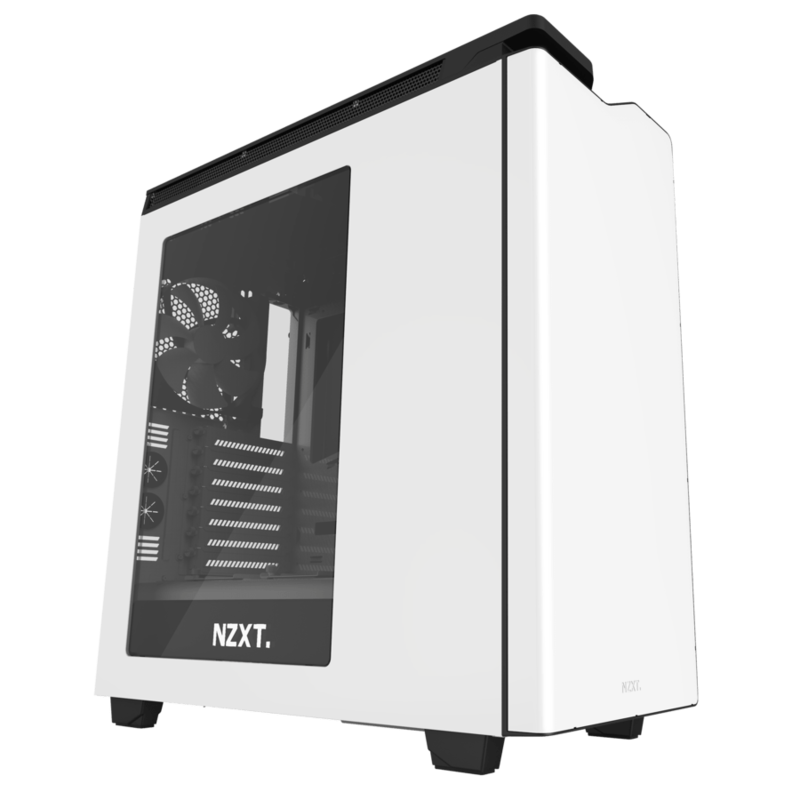 The H440 is one of NZXT’s most popular mid tower cases, offering a traditional squared-off shape complemented by NZXT’s signature liquid cooling support, cable management and clever power supply shroud. The case also promises to be quiet, with 5 millimetres of sound-dampening material lining most sides. We’ve built another XSR Test Rig inside, so let’s see how it went in our full review! 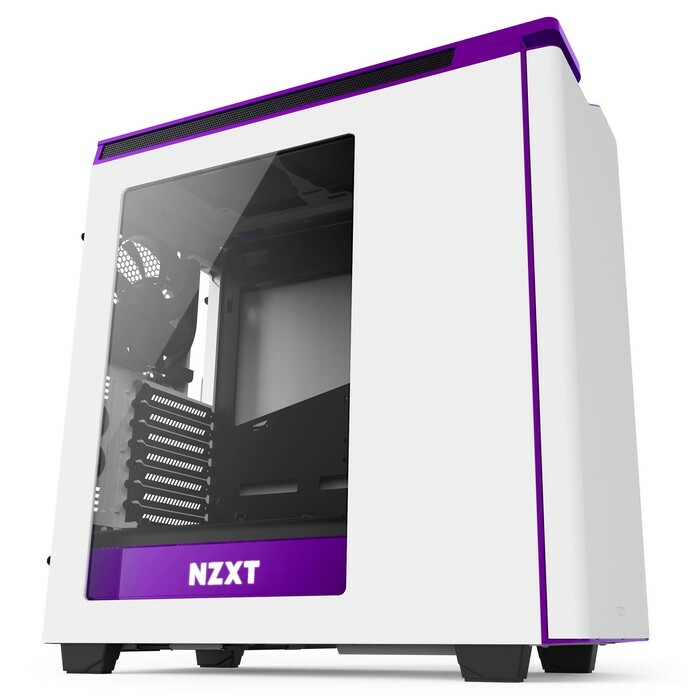 See more information on the NZXT H440 product page. 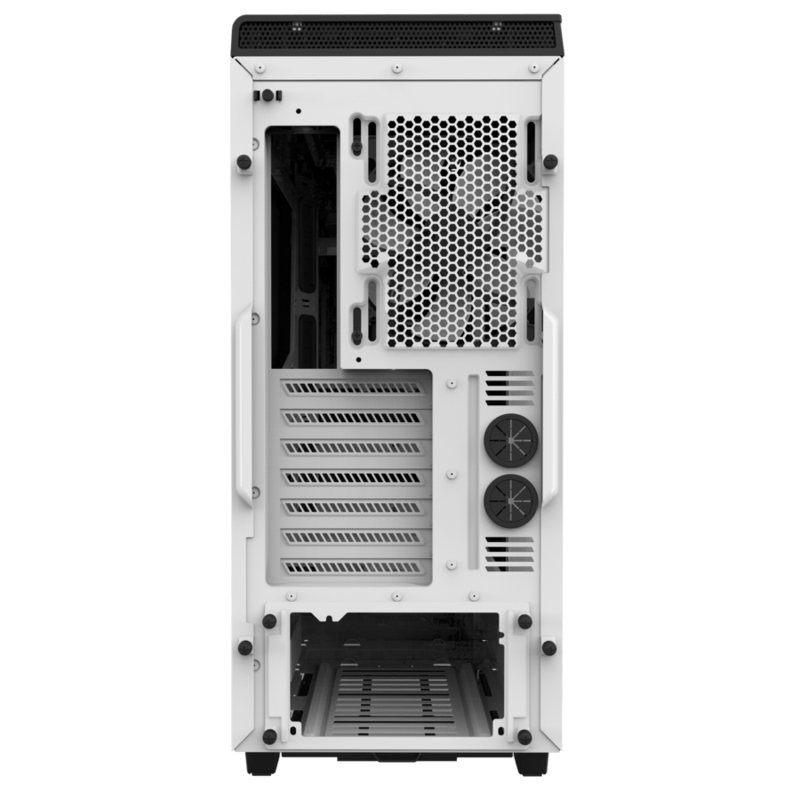 The H440 is a traditionally-arranged mid-size tower case. 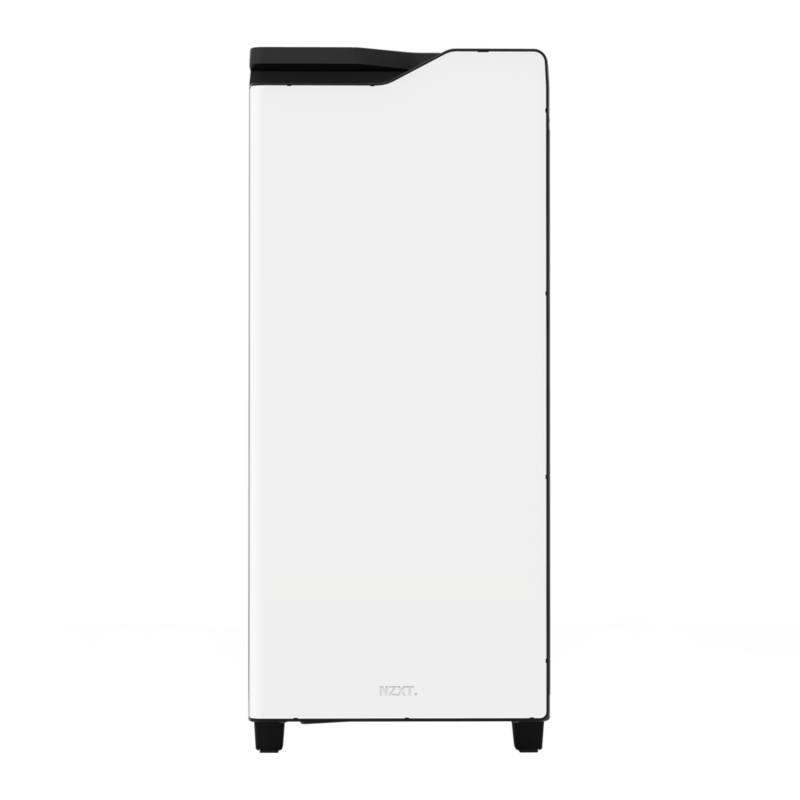 Like many other modern cases, it eschews 5.25-inch slots for a simple, clean facade. That means there’s no space for fan controllers or optical drives, but maximises space for other components. Remove the front panel, and you’ll find three 120mm NZXT fans have been installed by default. The render below shows the front with the magnetically-attached dust filter removed. 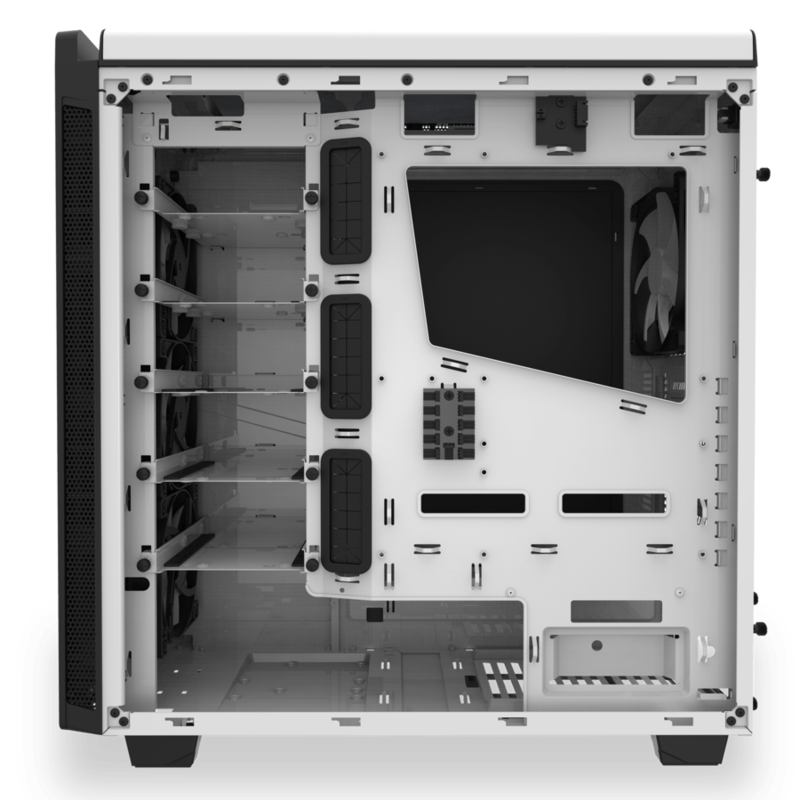 The H440 has a tempered plastic window cut into the left side panel, comprising a little less than half of the total area. This window shows off your motherboard, CPU and graphics card, while hiding the messier parts of your computer. 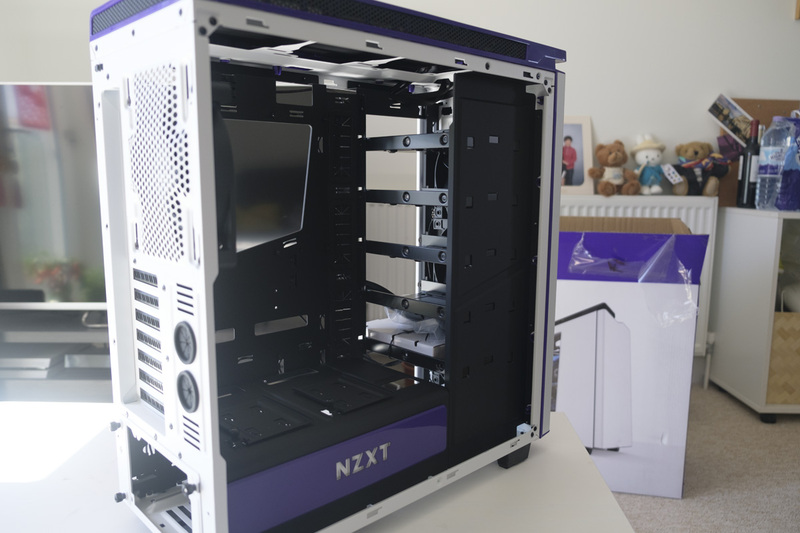 The typically untidy PSU area is covered by a coloured shroud embossed with a glowing white NZXT logo. If we open up the window, you can see the space inside in greater detail. There are two SSD trays on top of the PSU shroud, with plenty of holes cut to allow cables to be routed. 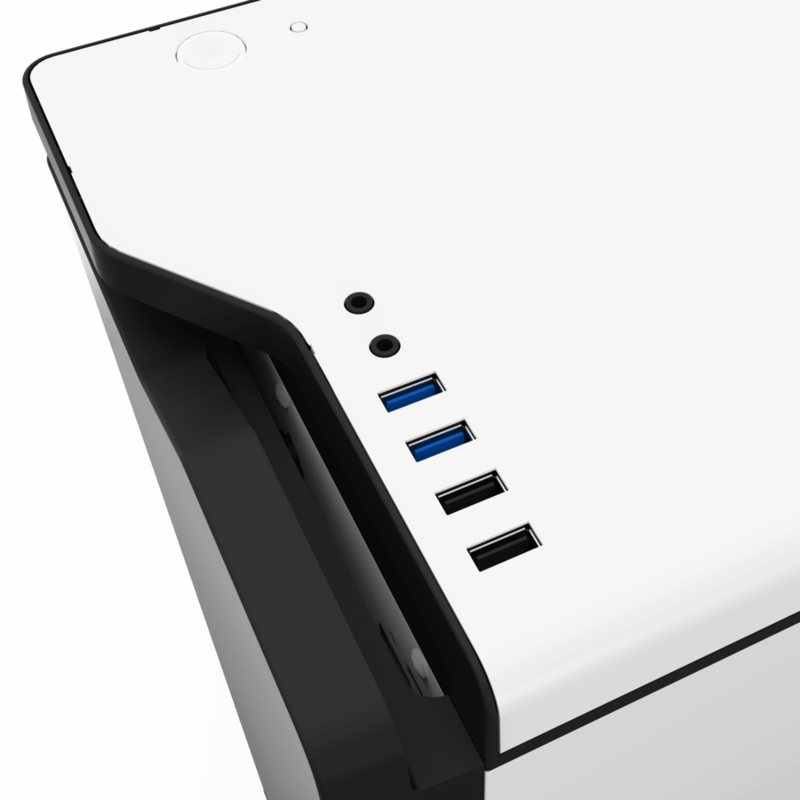 The rear of the case includes five hard drive bays, which can be adapted to suit 3.5-inch or 2.5-inch drives or removed entirely. 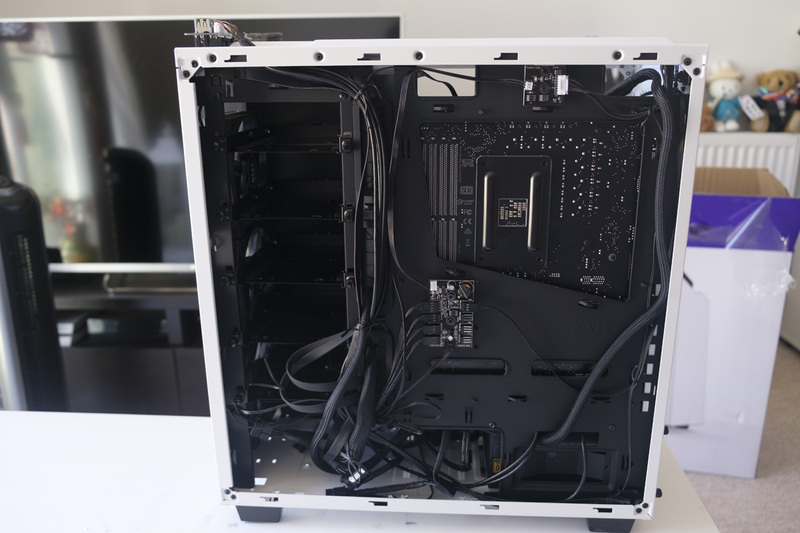 You can also see the shrouded cable routing holes that line the centre of the case, allowing free access to components without showing off all of the dirty laundry within. 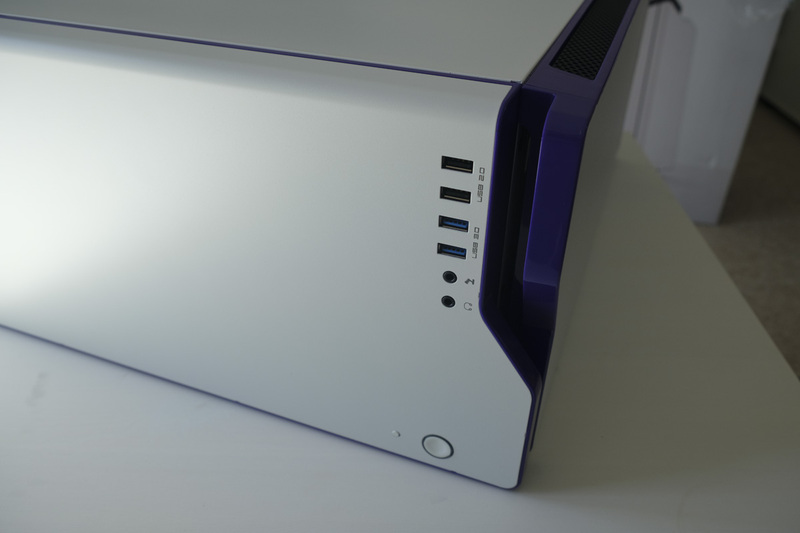 This is a much nicer solution than the all-metal off-angle apertures we saw in the NZXT Manta, although there is also much more space here to pull it off. If we take a wider look at the rear panel, we can see the drive slots along the left, the three shrouded apertures in the centre, and regularly placed mounting points for cable ties and the like. Near the bottom of the far-side panel is the PWM fan controller. This allows up to eight fans to be connected, although the motherboard header alone can only provide about 1A of power so you may need to use the optional MOLEX power connection if you are using a lot of fans, particularly those with LEDs. 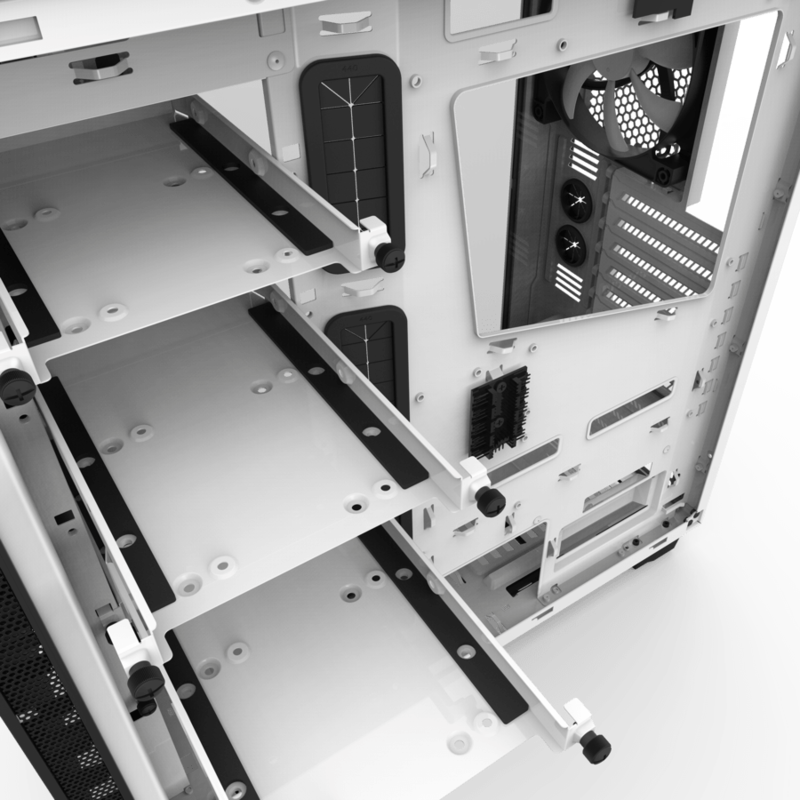 The back of the case includes all of the elements we’d expect on a high-end case: grommets for water cooling, space for a 120 or 140mm case fan / radiator and the usual I/O and expansion slot cutouts. 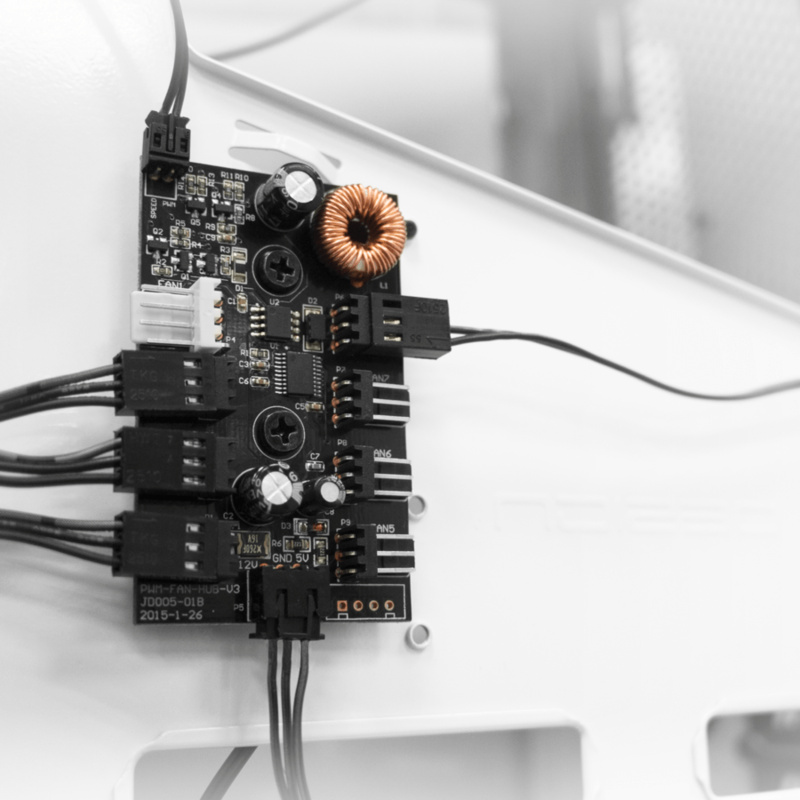 At the bottom of the photo below, you can see how the PSU includes a small removable cover, which is affixed to the PSU during installation and ensures pixel-perfect placement. Finally, a button near the top turns on a small white LED which illuminates the rear I/O ports. We’ll conclude with a look at the top I/O, which includes two 3.5mm ports for headphones and microphone, two USB 2.0 ports and two USB 3.0 ports. The power button is also here, which lights up in white when the system is turned on and flashes when hard drive activity is detected. It’s all pretty standard, but it looks good. All in all, a clean and well-presented case that seems to make sensible design decisions throughout. Now, let’s move onto the build to see how it fared in our real-life system building and testing. The build has areas of obvious weakness. In the future, we’ll look to add liquid cooling for the processor, upgrade the SSD to a faster PCI-e NVMe model and swap the GTX 970 graphics card for the GTX 1080 in our previous test rig or for a forthcoming AMD Vega graphics card. The primary goal was to keep both the MANTAMACHINE (our previous test rig) and this new AMDMACHINE fully operational, rather than make the single best / fastest machine that we could. We begun work around 11 o’clock on July 5th as the parts were delivered, and finished by about 2 o’clock that same day. 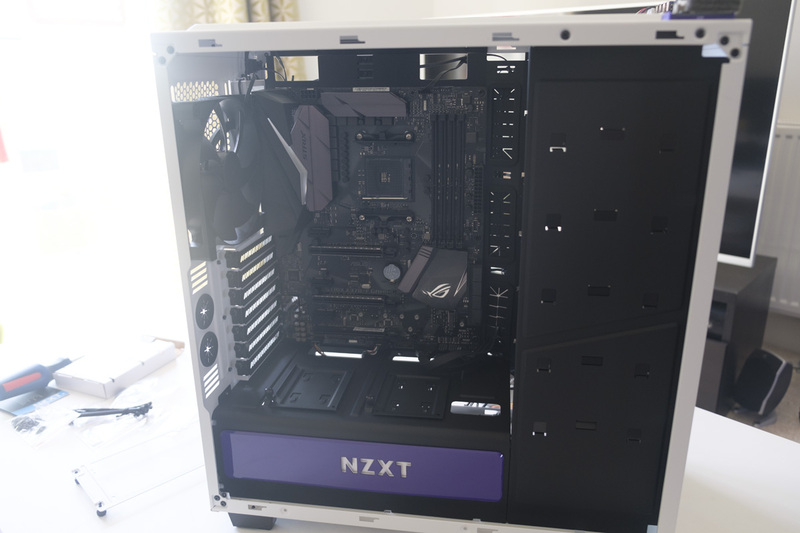 We begun by removing all of the panels — left side, right side, top, front — from the NZXT H440. We then installed the motherboard, sans the I/O shield as this motherboard will have to be returned after its loan period is over. This full-size ATX motherboard was easy to install, with plenty of room to manoeuvre it into position. Once the motherboard was in place, we used nine of the screws provided to carefully affix it into position without over-tightening. Afterwards, we connected up the various cables that go between the motherboard and the case, including the power and reset button controls, hard drive activity LED, and USB 2.0 / 3.0 headers. From here, we installed the processor, removing the standoffs that come pre-installed on the motherboard to allow the Wraith Spire cooler to be installed properly. This was a bit touch and go, requiring pressure on both the cooler’s screws and the plate on the back of the motherboard, but eventually we got two screws in and from there it was a case of tightening it until we felt the end of the screw’s travel. The high ambient temperature in the room caused the thermal paste to get a bit melty, but hopefully that won’t impact our final build. The PSU was next to go in. 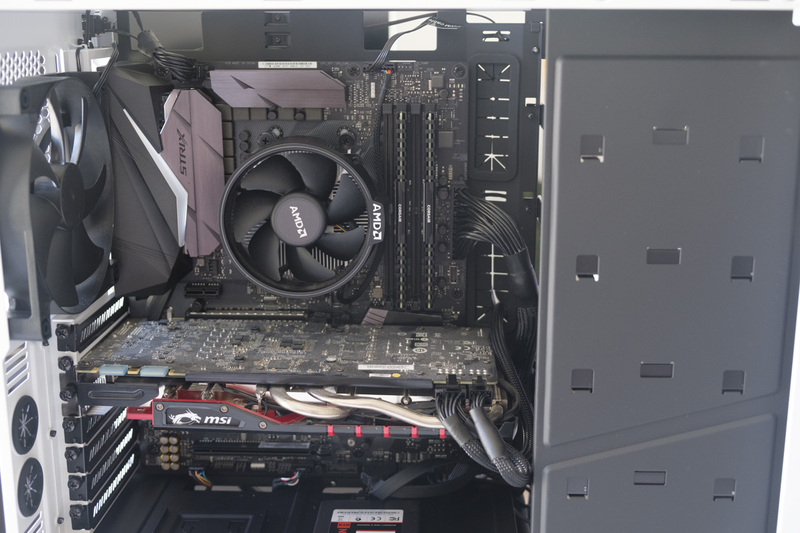 We chose a modular example from Corsair, so we connected just the cables that we would need – the motherboard’s power input, the CPU auxiliary power input, one cable for the fourteen (6 + 8) pins that the GTX 970 would require, one string of SATA power and one string of MOLEX for the built-in fan controller. These cables were threaded through the shrouded apertures in the case next to where they needed to be plugged in, then connected to the PSU. Before the PSU can be inserted into the case, you’ll need to unscrew the metal frame from the case, attach that to the PSU, then slide the combined contraption into the PSU area. This serves to ensure the PSU is properly oriented (fan-side down) and positioned. The fan controller isn’t well documented when it comes to installation. From what we’ve read online, you can power the fan controller directly from CPU_OPT on the motherboard, which allows for complete fan control, but only if the fans connected draw less than 1A of power. Otherwise, you’ll need to use the Molex connector. We ended up connecting both, which seems to have resulted in controlled fans — probably something to investigate further. After the PSU was in place, we got to work on the other small components. The RAM sticks went in easily enough, as did the GTX 970 graphics card. We needed to push our motherboard power cable a little bit out of the way, but otherwise the 269 mm long card fit just fine. The metal frames over the PCI slots needed to be removed with a screwdriver because they were so stiff, which is disappointing for something that should really be a thumbscrew. Finally, we housed the SSD on top of the PSU shroud, in the 2.5-inch SSD space provided. You need to connect the SATA and power cables first, then slide the SSD into position and screw it in place. Once installed, it looks quite neat and tidy. Once every component was in position, we tidied up the cables on the back with zip ties and closed the case back up. The top and front went on with few hearty taps of the palm, and the sides screwed on without issues either. There’s a good amount of space between the back of the motherboard and the right-side panel, so your cable management doesn’t have to be perfect to get the side panel on easily. Now for the moment of truth — we plugged the PC in, flipped the PSU switch and pressed the power button. At first, we thought it wasn’t working, because the fans hardly seemed to spin up at all… but after a few worrying seconds of darkness, the monitor turned on and the computer said “you’ve installed a new CPU!”. Damn right we have. 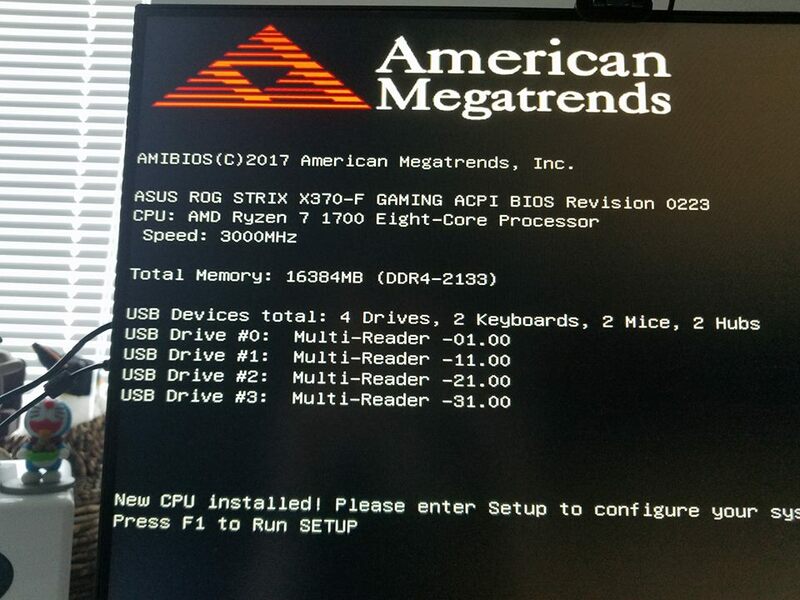 We installed Windows 10 using a USB stick we had lying around, and installed all of the drivers and programs listed on the ASUS site. In our initial testing we only noticed two problems. First, the top USB 3.0 ports didn’t work, so we turned off the PC and plugged the USB 3.0 header cable into the second of the two USB 3.0 ports on the motherboard — success! Secondly, the useful I/O light seems to be stuck in the on position, despite working as expected in the first few minutes of the case. We’re not sure if the cable was pinched or damaged during our installation, but we will investigate further to find out. 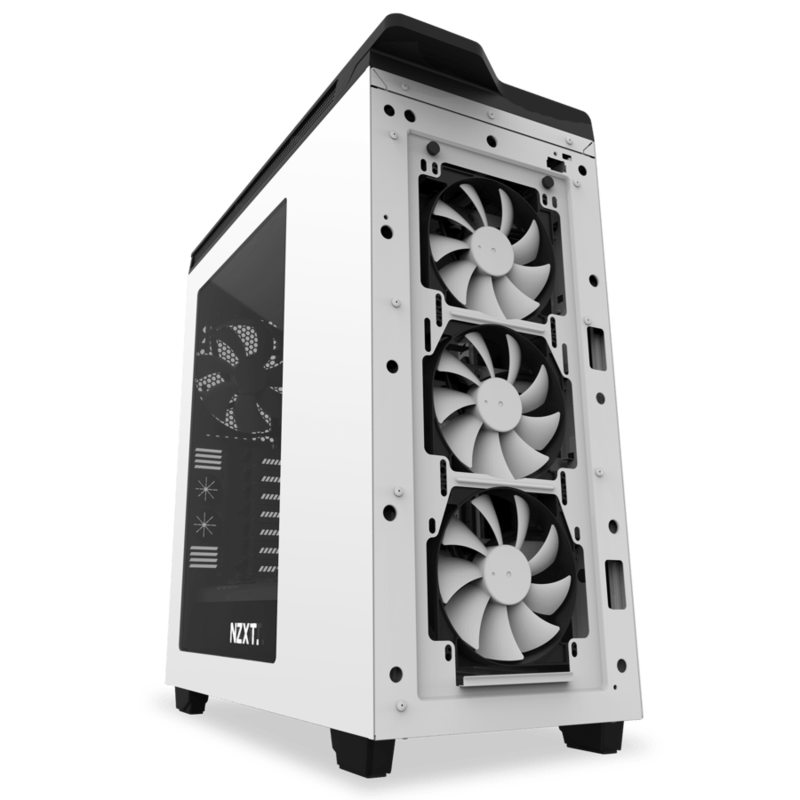 The NZXT H440 is a great-looking case, with a simple but elegant design. 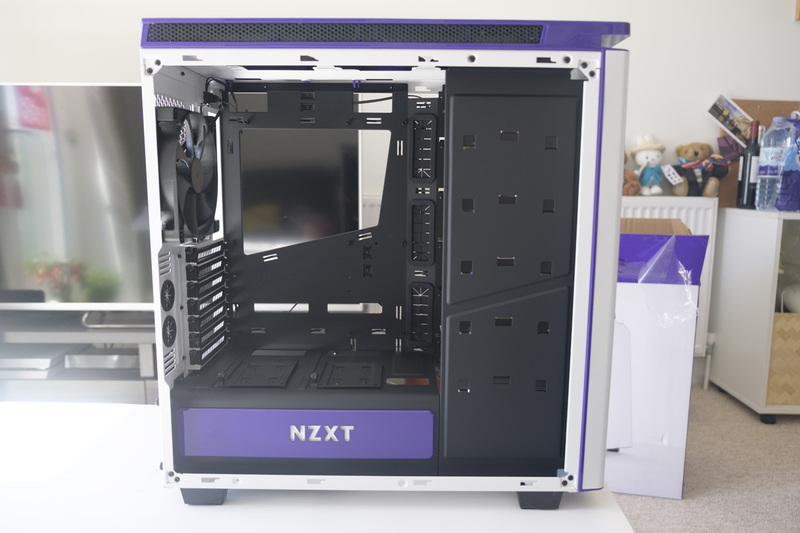 NZXT have moved away from their usual love of curves here (as evidenced by the Manta and Phantom cases) into something more ordinary, but there’s still a bit of flair in how the top and front panels come together with shiny purple ABS plastic. The white and purple colour scheme we’re using is pretty easy on the eyes. Other components are unlikely to match it, but with RGB LEDs you can certainly adapt components like fans, motherboards, graphics cards and light strips to match the look. The modestly-sized window also ensures that you don’t need to theme literally everything in your case; just the stuff over and around the motherboard should be sufficient. Installation proved pretty easy, thanks to the case’s generous space allowances. Plugging in the SATA connector was a bit of a stretch, but everything else seemed pretty easy. 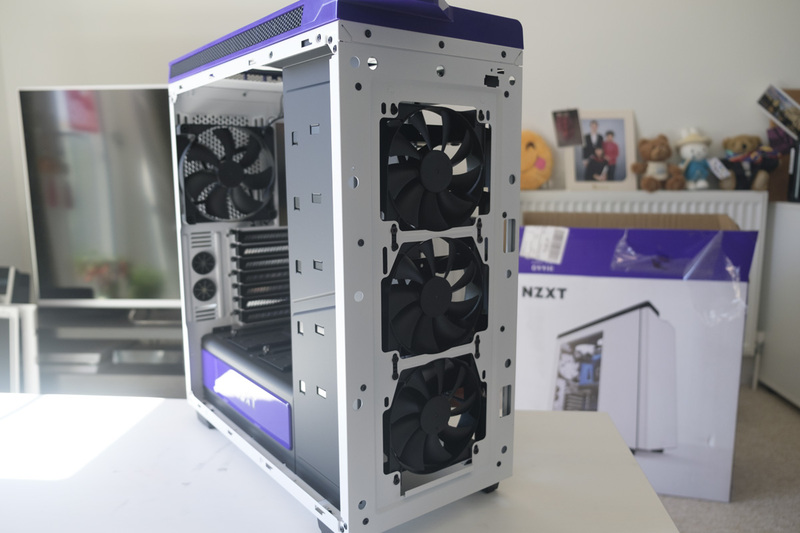 We definitely recommend doing your build on a table or desk in the centre of a room, so you can access all sides of the case without needing to move the case itself — this saved a lot of time. The apertures near the motherboard tray were particularly well designed; wide enough to allow plenty of cables to fit and with shrouds fitted to ensure everything stays neat and tidy. 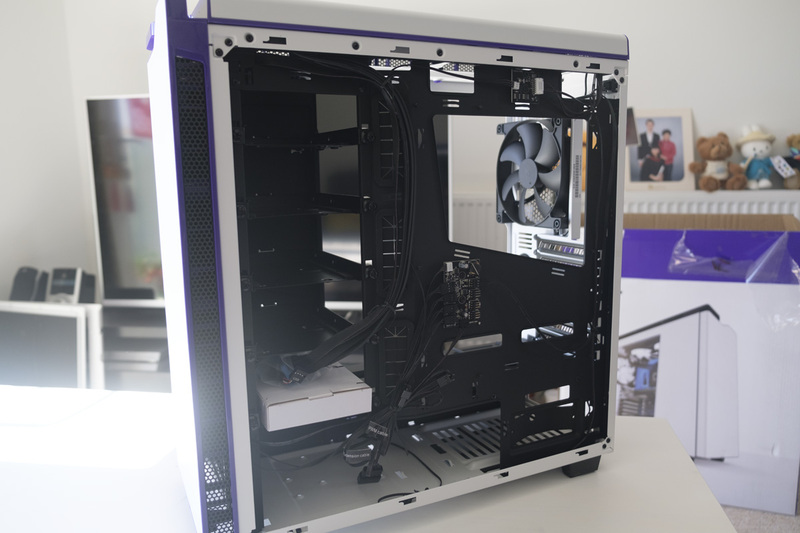 The PSU area has similar characteristics, with a large space dedicated to hiding the PSU itself with plenty of extra room for cables. 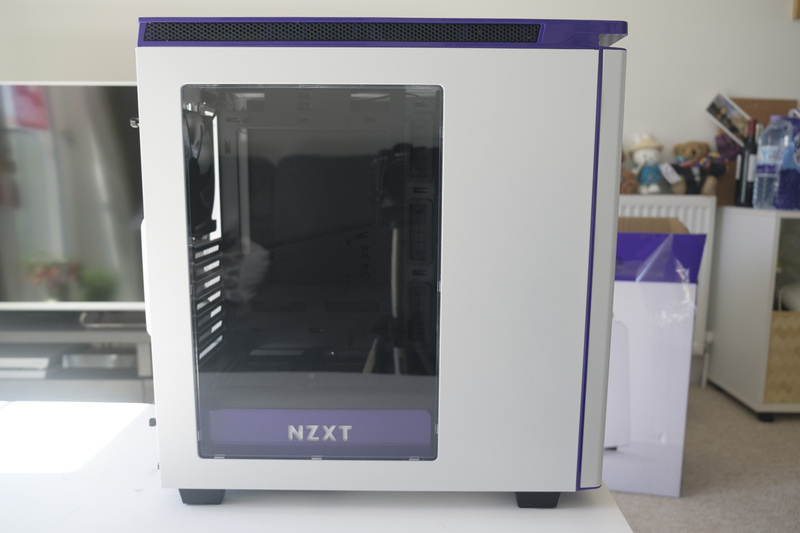 During our first day or two using the NZXT H440, we were repeatedly amazed at just how quiet it was. At idle, it was difficult to make out the hum of the case from only a metre away, with the wind and other quiet ambient sounds often drowning it out completely. We also enjoyed the top panel, which looks super clean and is easy to reach. Having four USB ports is brilliant, although in a few years time we might lament the lack of USB-C for charging smartphones, tablets and laptops and connecting peripherals. The case is pretty heavy at 10 kilograms unloaded, but feels very solid. With good bracing for your graphics card, you could take this to a LAN party without much worry at all. 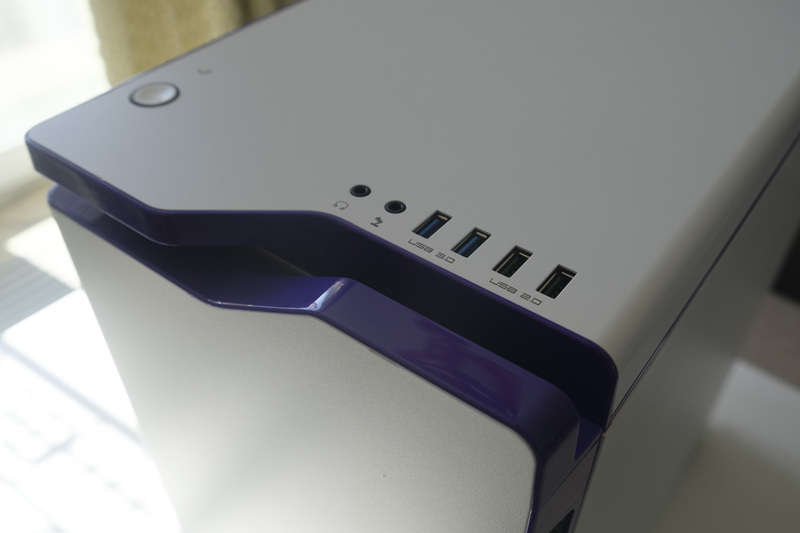 One issue we discovered with the H440 — or at least, our unit — was that the rear panel and PSU shroud lighting was sometimes stuck on. When this issue occurred, pressing the button above the I/O panel did nothing; normally it should toggle between the four states (both on, both off, PSU light on, I/O light on). Weird. 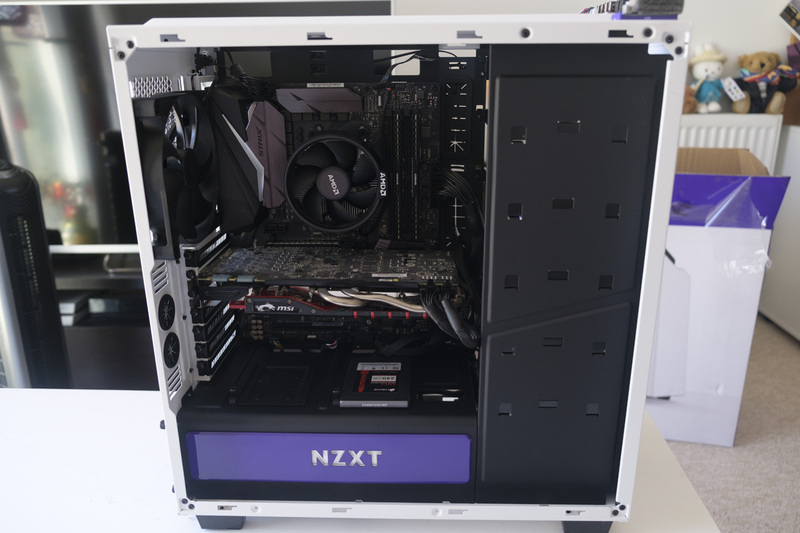 In order to provide our final judgement on the NZXT H440, we’ll need to run a few tests. We’ll be looking at the amount of heat and noise the case produces, both at idle and during benchmarks. We used the MS10 decibel metre in order to judge the noise of the case from a distance of one metre. We took three readings in each situation and averaged the result to arrive at our final reading. Fan speeds were set to ‘standard’ in the Ai Suite Fan Expert 4 application that was provided with the ASUS motherboard. You may notice that there are two CPU readings given, the first of which is exceptionally low. 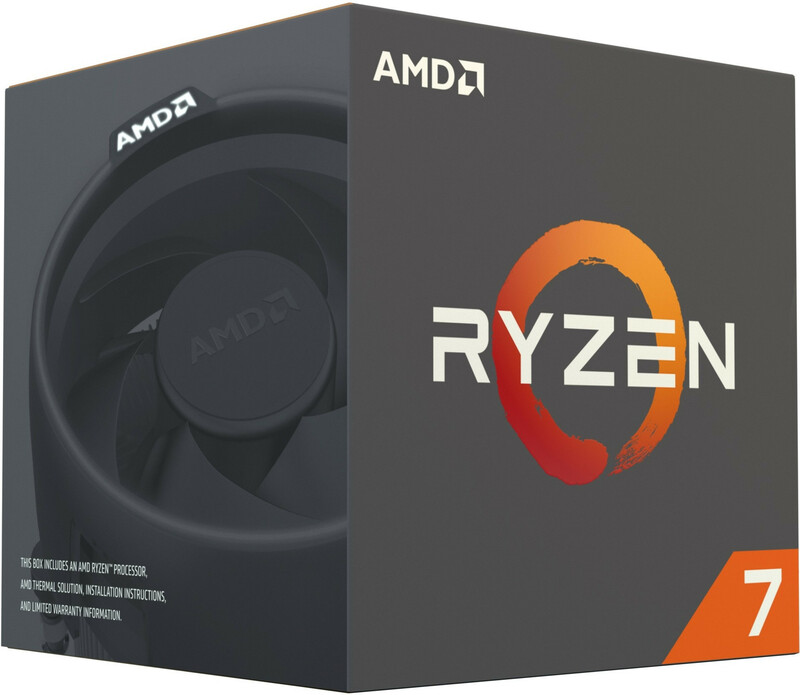 This is due to a bug with the ASUS ROG STRIX X370-F motherboard BIOS version 0808, where temperature is under-reported when used with the Ryzen 7 1700. The second number is the reading plus 27.2 degrees C, which should (in theory) be the correct temperature. We’re quite happy with the H440 in our testing, and we hope that this article has been useful to you if you’re considering this case. If you do end up picking one up, you can do so via our Amazon affiliate link to support our hard work. Thanks for checking out the article, and be sure to leave your feedback and questions in the comments section below! Stay tuned for a review of the motherboard we used in this build, the ASUS ROG STRIX X370-F.